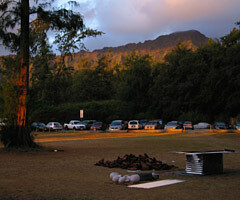 If you are interested in raku firing, you'd love the Hawaii Craftsman annual fundraiser event, Raku Ho'olaule'a. This long-standing event on Oahu was held June 2, 3 and 4 this year at the Waimanalo Bay Beach park on the east side of the island and we decided to take advantage of this great opportunity. It's a week long event including lectures, wet clay demonstrations, a tea ceremony and then the long weekend of firing at the beach. 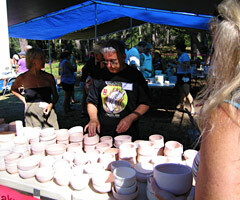 Each year, they host a community kiln open to the public. The new venue is proving to be a good choice with low consistent winds, no rain, and a full moon rising above the Koolau mountains, you really couldn't beat it. Each morning we woke up to a beautiful sunrise over the Pacific ocean. It was so clear one morning, we could see Molokai, Lanai and Maui from the beach. At sunset on Friday, the weekend event opened with over a hundred members joining hands to participate in a Hawaiian blessing with a kahuna. Guest artist Rob Drexler from New Mexico built a fire box container on top of a cement pad for a group pit-fire demonstration. Here's a simple and cheap way to create your own container. He took a long 3 foot wide piece of corrugated metal, folded into a rectangle with sides about 6 feet long, stapled the open side and used two more pieces of corrugated metal for the lids. This held a surprising amount of heat and they burned a considerable amount of wood. Rob mischievously spied looks at us in the crowd as we gasped, horrified when he dealt blows to bisque ware, cracking it with a hammer into pieces, then placing the pieces in various parts of the kiln. 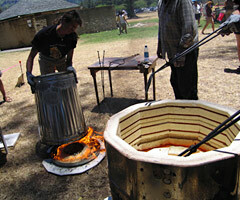 Rob has a special technique of deconstructing, pit-firing the pieces and then reconstructing his pots. You want to nestle, kind of half bury the bisque ware in the sawdust expecting the buried parts to be black from the carbon when the sawdust burns away. He buried the ware in 6-8 inches of sawdust laced with copper carbonate and iodized salt. "I'd use the flake salt, you know that really fine one they make for popcorn, if it weren't so darn expensive," Rob smiled. It's all about the chemical reactions, he reminded me and this will happen easier with the small grains of salt to activate the copper carbonate once the kiln reaches a certain temperature. I've used rock salt myself and sometimes discover a 'pitted' area on the surfaces so I was eager to switch. 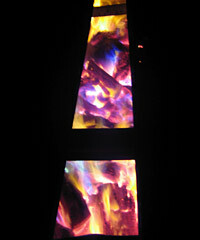 Rob lit the pitfire on Friday night and for a lucky few who hung around to ask questions, we got great insight. Many people come to an event like this to learn and share experiences, to ask questions and gain insight into problems we need to overcome in niches so narrow, the information may not be widely available. This is the kind of event where both the experienced master or a complete novice can learn something from each other and share the experience with others in the community. Rob was open with his information and shared freely with those who questioned, as did many others. 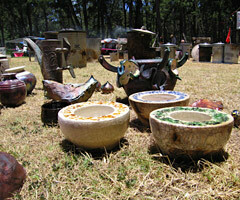 Saturday the community kiln is open for the public to participate. You pay $5 and choose from a selection of prebisqued (ready to glaze and fire) teabowls. Then, you go to a glaze station set up with samples of the finished look, glazes and brushes to apply. 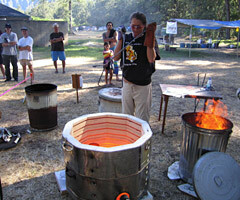 Volunteers from Hawaii Craftsman fire community kilns all day long. Once your piece is glazed, you put it on a preheat burner, where it dries the glaze, then it gets loaded into a raku kiln. When it is hot enough, the piece is pulled hot from the fire and placed into a container with some form of combustible material. A 'reduction' is the final part of the raku process, it happens when the heat from the hot pot, ignites the materials resulting in oxygen being removed from the container, the pottery and the glaze, forming a post firing reduction. While you wait for your tea bowl to be fired, walk around the beautiful park and check out the incredible work being produced for the team competition. If you want to participate and you don't live on Oahu or even in the state of Hawaii, the Hawaii Craftsman can assign you to a group. 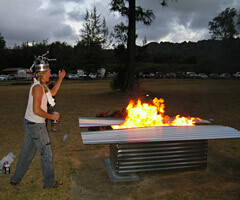 I came from Maui and was assigned to the 'Flaming Misfits' a group from Oahu, Maui, Oregon, Maryland and Pennsylvania. Warren from Hawaii Craftsman, was kind enough to bring the kilns, shelves and tools for our use. 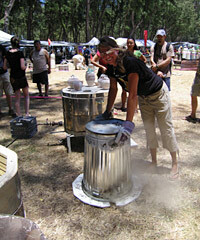 Each team had two or more kilns hooked up to a propane tank along with a tent and a table for glazes. With the same glazes, kilns and tools as your teammates, everyone competes to create the best pieces. 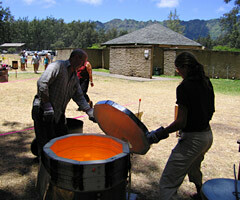 There was pitfiring going on as well and some of the finest pieces came from Jeff Changs team from Oahu. On Saturday, Rob pulled his shards from the pit-fire and reconstructed whole pots as we watched. How? With Elmers glue and a good knack for puzzels I'd say! Since each piece has been fired in a different spot in the kiln, each has a unique finish. The result was kind of a patchwork look and an interesting effect which begs the question, "How did you do that?" or "Hey was that broken?" You see that contrast in colors between the red, white and black?" Rob asked, "That's from a hot enough fire." When it glows hot orange, he throws in copper carbonate and the flames turn bright teal to electric blue and you can see that chemical reactions are happening. If you arrive and set up early, the advantage is you will have pieces to show and discuss. Saturday is a long day, firing many loads, back to back in multiple kilns. One of the best things about the event is walking around the dark park on Saturday night. Teams are hustling to finish before midnight as we are all safely locked into the park. Rob and his partner Kyl provided entertainment swirling balls of fire around for us then turned to the crowd and asked "Who wants to try next?" Many did! 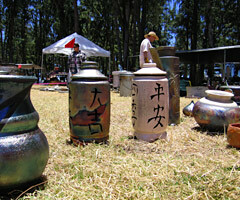 Pyromaniacs to the core, these raku artist. Sunday is an easy day and by 10am teams begin to submit works to be juried by the guest artist. It's a rush seeing a piece you saw pulled out of a red hot kiln, the night before, clean and shining before you, standing up next to the other entries, asking for it's rightful place in the show. The show runs June 19 - July 15th at Mark's Art Garage, 1159 Nuuanu Avenue in Chinatown, Honolulu. Hours are Tuesday thru Saturday from 11am - 6pm. Marks Arts Garage hosts Hawaii Craftsmen events and many, many other interesting art and performing art events in Honolulu. If you missed the event this year, be sure to mark your calendar for next year. 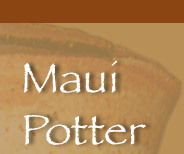 The Hawaii Craftsman Guild has an annual juried show in the fall as well. If you are a fan of the arts, be sure to check into Mark's Art Garage often, they are an excellent venue for Hawaii artists so please come out and see what they bring to us.